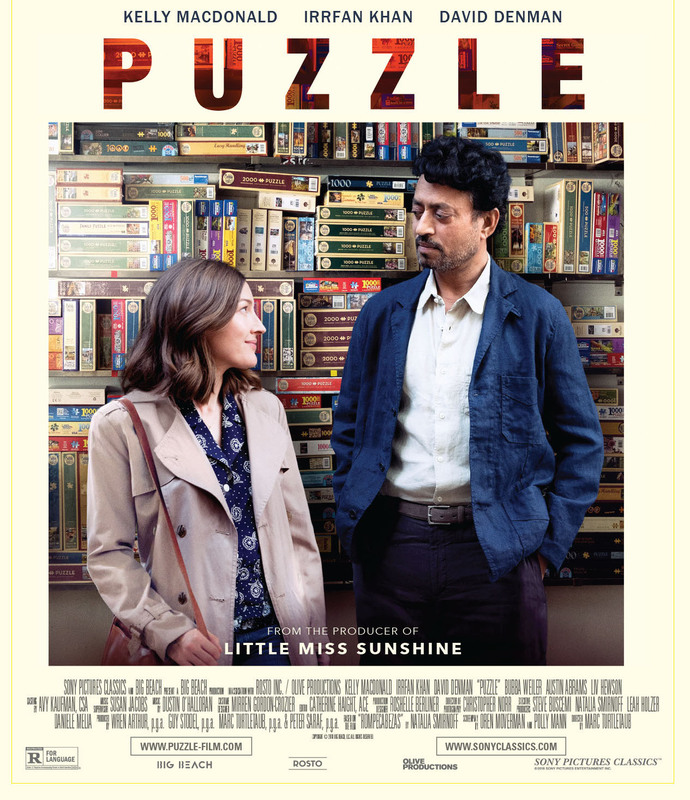 Featuring an outstanding cast that includes the brilliant Irrfan Khan, the amazing Kelly MacDonald and the excellent David Denman, Marc Turtletaub’s Puzzle opens in theaters in New York and Los Angeles on July 27th. A powerful but uneven adaption of the Argentinean film Rompecabezas, Puzzle transplants the tale from Buenos Aires to Yonkers and New York City. It is the story of a very repressed, closed off woman coming into her own and finding her true self. Puzzle is a small portrait of the small life of Agnes, who has reached her early 40s without ever venturing far from home, her family or the tight-knit community in which her widowed father raised her. That sheltered, predictable life begins to change in a quietly dramatic fashion when Agnes receives a jigsaw puzzle as a birthday gift and experiences the heady thrill of not only doing something she enjoys, but also being very, very good at it. After years of concerning herself exclusively with the needs and wants of her husband Louie and sons Ziggy and Gabe, Agnes has found something that she wants to do for herself and not for her family. Stepping out of her domestic bubble to pursue her new hobby, Agnes meets Robert, a wealthy, reclusive inventor who immediately recognizes her talent and recruits her as his partner for an upcoming world jigsaw tournament. Each day she spends out in the world, puzzling and conversing with Robert takes Agnes further along on the road to a new understanding of herself and her strengths. Ultimately, Agnes decides for herself what comes next and you will find out what that is when the film hits the big screen. First, we must talk about Kelly MacDonald, who completely became this character. If you did not know that this was her, you would never, ever guess that she was playing this mouse of a character. But when the mouse begins to grow and learn and shine you see every moment through her eyes, her tone of voice, even how she moves. One of the best things is that she never loses sight of who Agnes is at heart even as Agnes blossoms. From the quiet acceptance, to the spark of excitement, the nervousness, the vulnerability, the fully realized excitement, the desire, the anger, the smiles, the love, and everything in between she hits them all perfectly. You are not seeing an actress playing a role – she is fully Agnes. Her accent was a bit odd in places but that is nitpicking. She is outstanding! David Denman as Agnes’s husband Louie is another stand out performance. Again perfectly cast, it never feels as if he is playing a character. He is this guy, who lives as he has always lived and how his father lived. He is not a completely bad guy although there are moments when the way he speaks and interacts with Agnes will make you feel anger towards him. But Mr. Denman’s performance helps us to look beyond our visceral reactions and to think about why he is acting the way he is towards Agnes; he thinks his life is perfect and does not see anything outside of what he is and knows. He is confounded by the changes he is observing in Agnes and does not have the emotional maturity or world experience to know how to adapt to her growth. Two scenes particularly stand out for the emotion he shows and they are stunning in its truthfulness. I have always been an admirer of this actor and now even more so after this performance. However, though this is Kelly MacDonald’s film, without Irrfan Khan as Robert it would be so much less. From the very first moment he answers the door he is something ‘other’ and that is a complete compliment. When you see the film you will understand what I mean. His character is quirky, morose, strange, and in some ways locked inside his own world just as Agnes is. But he is in fact, in his quiet way, the one who brings Agnes to life and in turn comes back to life himself. He is so, so, so perfect in this film. So many times I thought whoa what an actor he is, even though you never feel as if he is acting. There are so many moments that are played perfectly. One that stood out particularly for me was the bouncing up and down in anticipation or desire he did, it was subtle but it was exactly right because without words you knew what he wanted. Also his eyes speak volumes. He always has this quiet, understated elegance but also this spark when he is onscreen. It is indefinable how he does that but it is on in full focus in this film and it is bravo worthy. I cannot imagine any one else playing this character. There are so many characters and performances that I have loved of his and this is very near the top. Mention must also be made of Ziggy played by Bubba Weiler. He was an integral part of the film and added so much by his earnest performance. He is an actor I will remember and look forward to seeing in other roles. Puzzle in many ways is a puzzle because many of the parts fit together to make a picture come to life but some of the pieces feel out of place. It is a fabulous glimpse into the world and lives of Agnes, her family, and Robert that both works and does not work. It works because we do feel as if we are a part of her world, watching her closed off life and then her finding, perhaps, the way her pieces should fit together. We feel as if we are there with her, experiencing everything and I put that down to the performances, which are the key. We are there with Robert coming back into life. However, the screenplay lets the story down and thus the film, because it jumps around so much that at times it is a bit jarring. It seemed as if much was left on the cutting room floor. I liked the film enough that I wanted to see all of those parts I felt were missing. Mainly the problem is that it leaves out details and embellishments to make the story fully realized and I wanted more. I wanted to see more of the puzzles both literally and figuratively. I like movies that make me think, as this one did, but I felt like I was missing important information that would help me to truly be able to understand and analyze the story on a deep level. The characters engage in some behavior and make some decisions that did not make sense based on what we already knew of them. Perhaps this is another example of important info left on the cutting room floor. Warning: the end leaves you wanting and I think it was the director’s deliberate choice to leave it open ended. I think I know why he did, but I still wanted some closure, which I think is a compliment to Kelly MacDonald’s character, story and especially her performance. Honestly, when the credits rolled, I was not sure that I liked Puzzle, but hours and even days later, snapshots and scenes played through my mind. It makes me think perhaps it was Agnes that I didn’t like. Maybe it was the way the story was told that I did not like. However, Even now as I am writing this I am thinking of the amazing performances and I want to watch Puzzle again. It is a film to experience, a brilliant look into a life and how it grows from something so small to perhaps something incredibly expansive. The performances make the film and for nothing else, you must see it for that. Irrfan Khan’s new movie Puzzle opens this Friday, July 27 in NY and LA with additional cities in August.